The highest peak in the world outside Central Asia, Aconcagua has become an increasingly popular goal for Seven Summits climbers who are seeking to expand their experience at altitude. This mountain can be a rigorous and rewarding introduction to the demands of expedition climbing to nearly 7000 meters. 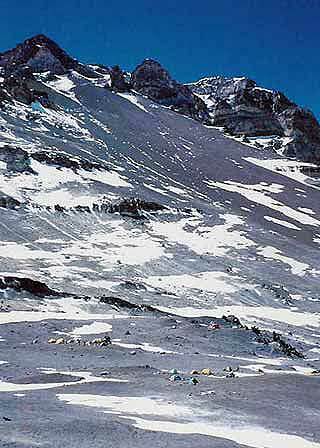 On Aconcagua, the task of load carrying to stock high camps, and the challenging weather with its high winds, as well as the fortitude required to stay with one climbing objective for three weeks, have shown many people what expedition climbing is all about. Before taking on Aconcagua, our first objective will be the remote and beautiful Ojos del Salado, the second highest peak in the Americas. This seldom-visited mountain offers a wonderful area in which to acclimatize. The climb itself is a worthwhile, unique objective for any mountaineer. Join Wally Berg and the BAI Aconcagua team as they go for the summit of the two highest peaks in the Americas. Jan. 17 - Berg Adventures Team Reaches Summit of Aconcagua!